At first glance, Hand of Fate may seems an RPG Dungeons and more, and yes, it is partly, but combines its own mechanical with a touch title collectible card that serves as the basis for weaving tapestry and a very close experience what would be, for example, the role of paper and pencil. And to be honest, is a combination that has seemed downright entertaining. Hand of Fate slapped us with a scent that first, remind us to games and books LARP, those in which we, as players, interpret a role and choose our own adventure based on our actions and decisions. It is a type of game that had its heyday in the first publications of books and standards fantasy adventure in the late seventies and early eighties, with representatives of Laureate success as the well-known Dungeons and Dragons, which has numerous expansions and issues that do survive decade after decade. Mechanical main game of Hand of Fate is easy to explain and understand. We are facing a title that bases its development based on the combination and use of different cards, showing various options, settings and destinations, where we will play with chance and strategy in equal measure while we beat against our opponent. In turn, Hand of Fate ensures that we take seriously that choose our own path, making decisions that may be beneficial or detrimental to our character and assuming its varied and profound consequences. Do we took a gamble and decided to enter the game of your opponent, choosing a random card for better sword or armor, or else we prefer to be conservative and venture to be a battle against an enemy with the very poor team we have? That is why, although we are talking about a RPG that looks firm parameters such as health, equipment or quantity of gold collect, we always have the possibility to increase our good or bad luck with a letter, changing the fate of heading in the blink of an eye. In Hand of Fate spend a lot of time choosing our own deck of cards which help us set ourselves our help and handicaps in each departure-and dodging as best we can, opponents and fighting elements that we presented at each session of play. The building system very versatile harness letters that mark us and let our hands on the challenge and the risk we are willing to take, offering great flexibility and inviting us to unlock new virtual cards with each game. Although the cards dominate and mark the path of most mechanical Hand of Fate, the game displays a visual representation of those fights. The chronology of card games usually include one or more meetings in putrid dungeon full of traps and fighting, that he should deliver real-time, assuming both a change of perspective and playable level. We will move from the relative passivity of the choice of cards to exchange blows and active in three dimensions, in which our hero will have to get rid based on Claymore or ax-in function of multiple weapons and defenses we have chosen-through enemy scenarios. In these, Hand of Fate becomes more frantic and unstoppable in this aspect, classic and much risky or transgressor, and remember at times, an action RPG old batch but modern look. The problem is that, although we believe that the performance of this camera is very successful battle, the truth is that we will find excessive repetition of enemies. The first three times we meet bandits, pirates, golems or barbarians will seem very entertaining and different-in fact fighting his blows link system is very markedly, but once us check that opponents are repeated, and that the variety of scenarios is not quite there, which ranges from caves and dungeons pirates shelters or camps deserts, among others we will choke on a bit. In any case, despite these problems, combos, flowing strokes and slashing with some joy-the locking system and attack Hand of Fate is very reminiscent of title like Assassin's Creed or Batman: Arkham City, to cite two examples, helping us to take seriously the fate of our character and we care to safeguard his health in different arenas why we go walking, in addition to getting involved with the achievement of certain very attractive rewards. Yes, represent a tacit motivation and some relief to the monotony of the cards and decks, but denote a certain carelessness and lack of tact in its execution, showing no real depth to keep you hooked to your proposal. Technically, Hand of Fate is a pretty basic game, not particularly excel in any field, but with sleek and well-matched in some of its visual aspects details. While the animations straight out of a title for decades, and suffers from occasional serious failure-we have witnessed massive loss of textures and late charges thereto- offers a carefully designed scenarios and a good job in lighting, which becomes noteworthy. The soundtrack, being honest, absent and we miss some other more environmental, oppressive or recognizable composition -yet, talk about a game where you spend much time in front of a hooded that will challenge us based cards- cards and more. Hand of Fate is in English, but has a very decent Castilian translation. 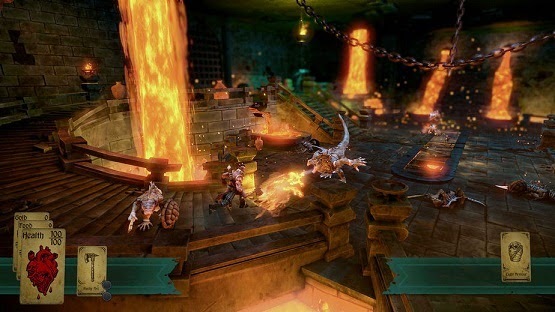 Hand of Fate is presented as a title capable of chaining different mechanical and playable successful proposals under a prism close to the action RPG classic and collectible card games. As if that were not enough, decides soak up the same feelings that exude certain RPGs paper and pencil, at times up looking like one of the closest to the board game Dungeons and Dragons we've seen in a long time experiences. Its tempo is enviable, by involving the user and active part in the development, history and the fate of his character and improve constantly inviting deck and features like equipment. You may have an outdated combat system and somewhat simple-even though it convenient to play - and even becomes repetitive past few games, but it seems a proposal sufficiently different, original and fresh, as in having into account.